It’s important for UX professionals to help the organization understand that not all useful data can be provided numerically. Of course, there are lots of useful numbers that we can collect as UX professionals – Google Analytics is a key tool for many UX designers on web projects and it produces a bunch of useful numbers. Numbers are quantitative and they bring plenty of valuable insights that we can use. But they are not the whole story. Qualitative data is the rest of the picture. We need to know why our users didn’t respond well to a particular feature and there’s not a number on earth that can tell us that. When we run an ethnographic study we don’t expect to collect a few easy to use pie charts. Sometimes data isn’t easy to handle. Sometimes it isn’t clean. That doesn’t mean it has no value. Data tells a story but only when it is interpreted. That means that the story that the data seems to tell may not be an accurate one. Good UX designers need to help people interpret data and bring attention to the limitations of any data set. If your Facebook feed lights up one morning with messages from users – that data is useful but it’s important to remember that it only represents the users you have that choose to use Facebook to communicate with you. It’s not representative of all your user base (unless your product is a Facebook only product). Don’t forget that you can influence data sets. If you go and walk a user through a product; their experience is likely to vary from the user who didn’t get such a walkthrough. Even in things like surveys, the way we design the questions can influence the responses we get. It’s important to remember that data is rarely a complete picture and that data can be skewed and even the largest data sets can be wrong. In some organizations it can be impossible to get your hands on the data that you need. Many companies seem to think that data is something that managers should have access to but the rest of the business should not. This can make life as a UX Designer, trying to take a data-driven approach, nearly impossible. There needs to be a mutual understanding as to what data is for and what it can achieve. There’s no point in any of us trying to work to improve data that is generated, measured and reviewed without our input and oversight. It is also important that everyone understands that data at a specific point in time is not always reflective of the long-term pattern. In some businesses, for example, sales conversions will be monitored hourly. A bad day can then become, to some managers, indicative of a problem that doesn’t exist. If you can’t even see that data – it’s unlikely any response you make to it will be flawed. 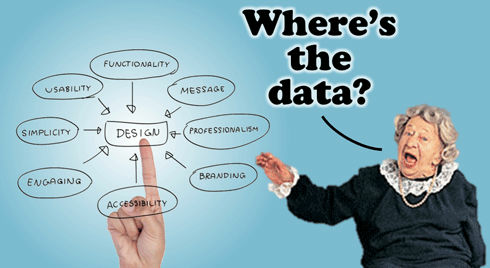 Data really needs to be open in order for it to be used to base design decisions on. It also needs to be able to be questioned. A bad day today is not a disaster. A bad year just might be. Many people feel that data impedes innovation. Why? Because it’s focused on the past – it examines what has happened and not what will happen. There’s a feeling that examining data is reinventing the wheel. This isn’t the case but it is important to realize that there are limitations when it comes to predicting future performance from past performance. Data is often used tactically but that doesn’t mean that it can’t help strategically. Once again, it’s down to how we use and interpret data rather than a limitation of data itself. You can drive a great user experience through data – it’s a UX designer’s job to do so, you just need to think about the way you do things before you do them. Then there’s the idea that because most data sets are not a “complete picture” (for example, Google analytics may tell you your bounce rate but it’s hard to determine why people are leaving the site from that data) that they don’t provide enough information to base design decisions on. If that’s the case – get more data. It really is as simple as that. If you find you lack the right data, go and get it. One data set can show you what to look at and another can tell you why something is happening. Don’t let limited data prevent innovation. The most important thing for UX designers to remember is that there are many ways to skin a cat when it comes to using data. You can use one data set for many purposes and another for only one. You need to be flexible in the way that you approach data and to prepare others to be flexible in the way they review data too. Be cautious with data, don’t try and infer too much or to push data to fit a theory. Be clear about the drawbacks and downsides of treating the data with too much respect. Always remember that ideas drawn from data can be tested – they don’t have to be spoken as gospel until they have been. A data-driven approach to UX design can be a good thing. It’s important to fully understand the data you have, to be able to access enough data to make decisions on and to be clear about the ways that data can and cannot be used in order to make the best of this approach.